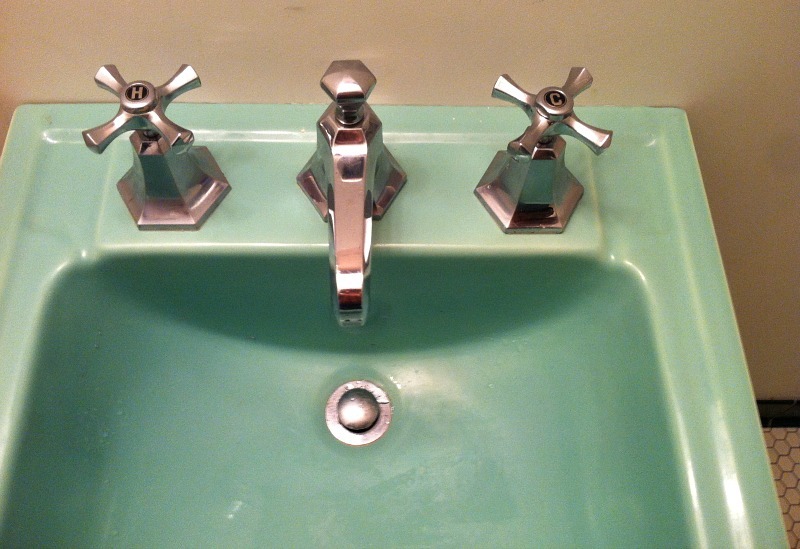 On this site, vintage "Standard" fixtures refers to fixtures produced by Standard Sanitary Corporation, until 1929 and American Radiator and Standard Sanitary Corporation until 1967. Standard Sanitary Corporation's merger with American Radiator Company in 1929 created the American Radiator and Standard Sanitary Corporation. The fixtures produced continued to be marked simply "Standard" until the name change to "American Standard" in 1967. Accordingly, the term vintage "Standard" fixtures embraces the products of that company in it's various incarnations from its inception in 1875, through the first set of mergers in 1899, into the first half of the twentieth century, and finally into the middle of the twentieth century. 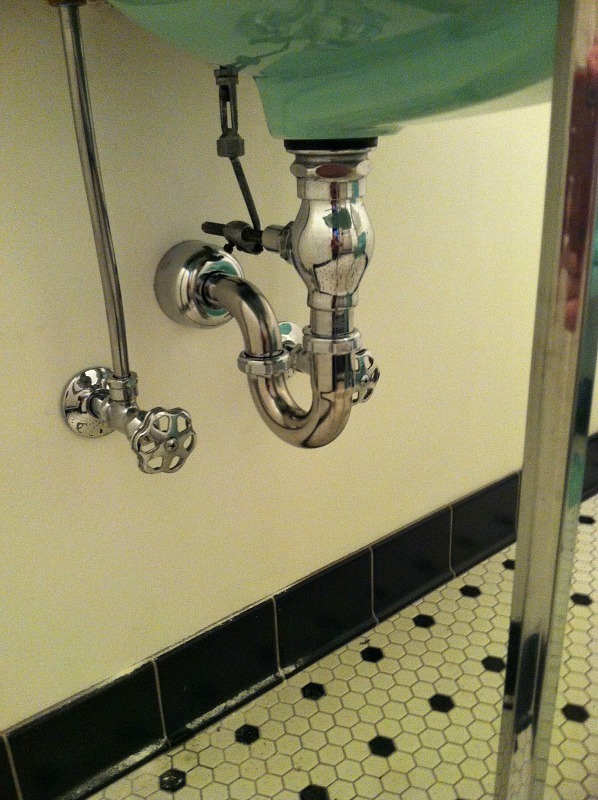 Throughout that period the company pioneered many plumbing product improvements. You can find an interactive list of their innovations and products on the American Standard website. 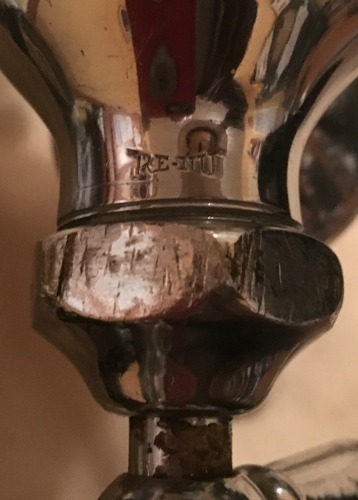 One of their best product improvements, and probably my favorite was the RE-NU faucet seat. This was a twofold benefit because it not only allowed a worn out seat to be simply replaced, it replaced the female side of the stem thread at the same time. Replacing the stem also when the seat was changed would greatly extend the lifespan of the fixture. One of the local mansions I have worked in here in Portland was built in 1927. 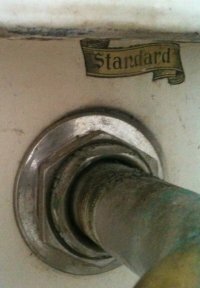 It is what I call a "Standard" house because the majority of the original plumbing fixtures were made by Standard Sanitary. There are RE-NU seats in most of them and though they are the early large sized RE-NU seats they are still available after market, as are the stems and seals for those faucets and valves. I am often asked to restore very old "Standard" fixtures and while I love to do it and give them new life, I am also a huge fan of mid century "Standard" products. I am very pleased to see the tremendous interest in the fixtures of that period that has been generated by the Mid Century Modern (MCM) movement. Better yet, those fixtures are not terribly rare. Because of the new interest and the fact that many faucets yet serve in their original settings, after market manufacturers keep most parts available. 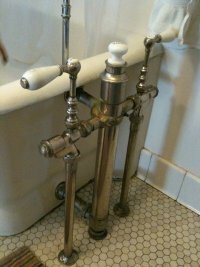 Of the many companies that made plumbing fixtures in the first half of the twentieth century, Standard Sanitary was among the most popular and prolific. Moreover their products proved to be enduringly serviceable. For these reasons there are yet a great many vintage "Standard" fixtures around, both in salvage houses and those still in there original settings. This one hole RE-NU faucet was recently on my bench and is now ready for installation. 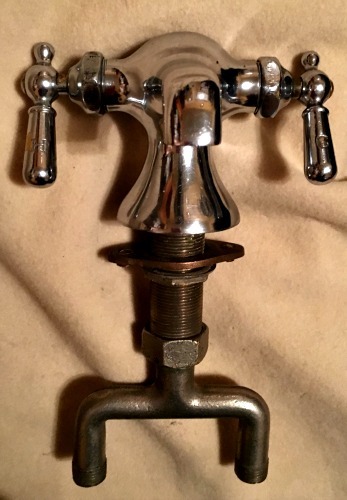 It can be found on my Vintage Bathroom Faucets page. This is typical of the fixtures that are sent to me for restoration. This fixture though is local so I was able to service it in place. These images are from one of my early jobs but I always loved that this label remained intact. I originally created new fuller balls for this fixture out of black rubber. Later I replaced them with my improved neoprene fuller balls. I was recently there again to stop a leak at one of my neoprene fuller balls and it was the first time I would see one of them after at least a year of service. What I found was that a foreign object had come up the line and lodged against the side of the ball, between it and its seat. That left a mild dent in the neoprene but other than that it was entirely intact and free of wear or corrosion. I replaced it only because of the shallow dent. 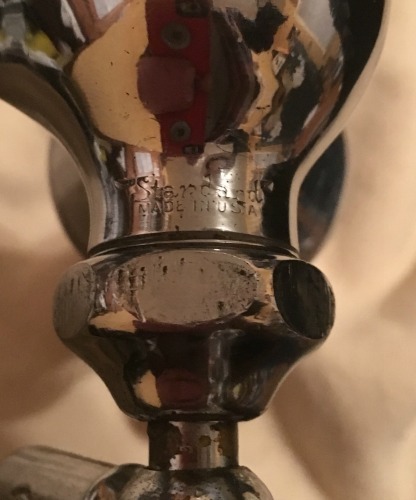 More information and photos on this fixture can be found on my American Standard bathtub valve restoration page. 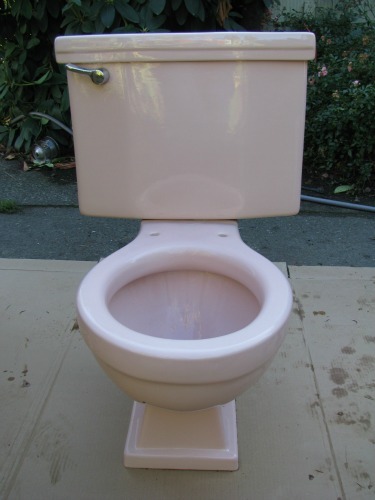 Here is a photo of a pink "Standard" Cadet toilet. I assembled it in the driveway for a few photos, trying to find it a new home. I still have it boxed and in storage. 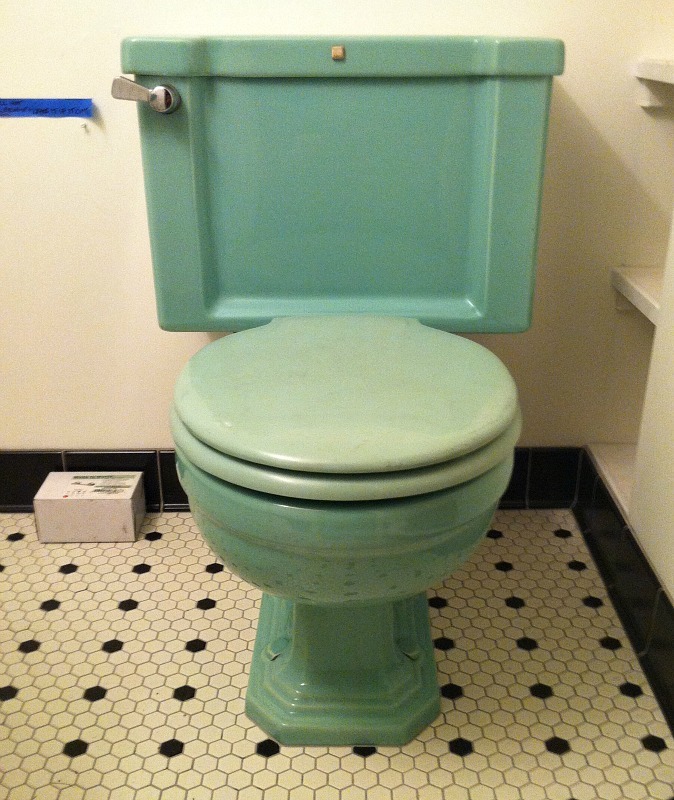 It can be found on my Mid century Pink "Standard" Toilet page. Here is a set of fixtures that I was asked to restore and set. 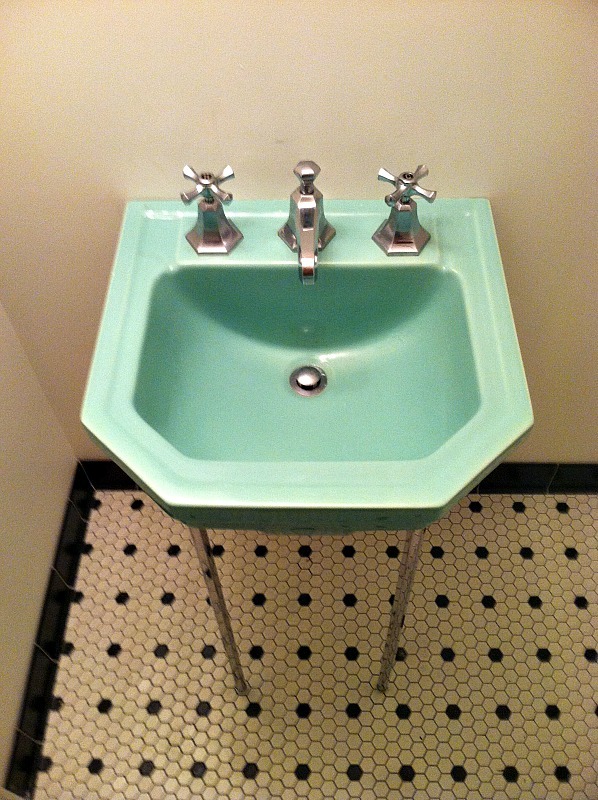 The color is Ming Green, the toilet is an F2045 Compact, The faucet has the Waldorf trim, and this information is listed in my 1937 Standard catalog. Note the service stops; they are also "Standard" and came from my stock. I am constantly on the lookout for more of them and the proprietary supply nuts that they require.